La La Land’s exhilarating and nearly unflagging energy strives to inspire in viewers an equally bold appreciation for all the things it celebrates: the thrill of romantic love, of dreams within reach, of what we call “movie magic.” In this, Damien Chazelle’s follow-up to Whiplash, an opening scene blooms into an ambitious song-and-dance number set in the midst of an Los Angeles traffic jam. It’s there our protagonists, Sebastian and Mia (Ryan Gosling and Emma Stone), will have a terse encounter foreshadowing their destiny as lovers, but not before a flurry of acrobatic dancing and joyful singing erupts around them, as if heralding their own flights of fancy to come. Cinematographer Linus Sandgren’s camera guides us through the excitement, weaving and spinning among drivers who’ve left their cars to execute a stunning sequence of choreography which appears to have been performed in a long, unbroken take. Chazelle does this with a simple story that follows Sebastian and Mia from meet-cute through love affair and beyond. In them he has created characters defined by their Big Dreams, who are sympathetic because of their insecurities and doubts. Sebastian is a serious musician and adherent to the tradition of jazz titans like Charlie Parker, Louis Armstrong and Thelonious Monk. Mia is an aspiring actress with an enormous poster of Ingrid Bergman over her bed (announcing the depth of her passion). Each has life goals they circle because they undervalue their ability to make them come true: Sebastian wants to open a jazz club but instead treads water as a sideman in other people’s bands; Mia serves coffee to the rising stars on the Warner Bros. lot, from where she occasionally breaks free to audition for roles in front of casting directors who barely notice her. Sebastian and Mia will meet a few times more on the way to falling deeply in love and fully investing in each other’s lives and life goals. On an empty street overlooking L.A.’s cityscape at twilight, they’ll play a coy game of hard-to-get as they dance and trade verses on the wry “A Lovely Night”: “There’s not a spark in sight / What a waste of a lovely night.” Chazelle builds their relationship through conventional movie scenes of dialogue so that he can launch them into transporting numbers featuring hummable, starry-eyed songs. These sequences frame Mia and Sebastian’s romance as idealized—and they are also where the film soars. A screening of Rebel Without a Cause leads to a late-night trip to the Griffith Observatory, where the pair shares another memorable dance, this time literally among the stars. An evening soft-shoe on a boardwalk finds Sebastian singing the laid-back and gently pleading “City of Stars” to express his growing feelings of new love. Later in the film, we’ll hear it as a cutesy-pie duet with Mia. Stone and Gosling make all of Chazelle’s balancing worthwhile with realistic performances; their musical segments are all the more transporting as they commit themselves to the old-fashioned allure of Chazelle’s conceit. Gosling conveys an attractive air of cool (and appealing vulnerability) without being self-satisfied. For her part, Stone endows Mia with sensitivity and vitality that drive her to work past her self-doubt, to confront Sebastian when she sees him taking the safe route in life. 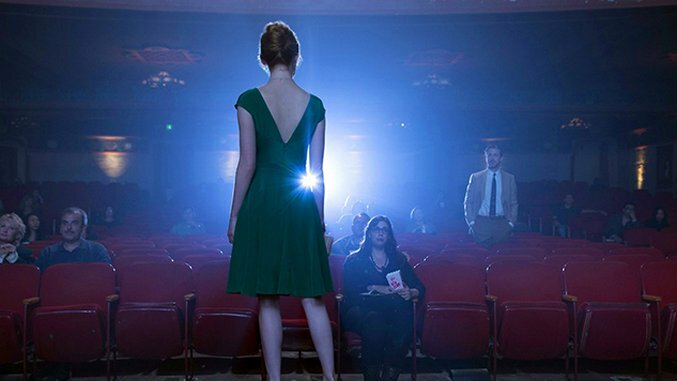 In La La Land’s extravagant final sequence, a destined meeting and one of Sebastian’s oft-repeated pieces of music are the catalysts for a series of flashbacks and imagined scenarios. This is Chazelle’s tour de force, one that culminates in his desire for us to see Sebastian as the wounded but noble and persevering romantic hero. To an extent, that’s Mia’s role as well, to admire Sebastian as his artistic talent lifts him above melancholy. The final moments we see between them could have used a bit more focus on Mia’s struggles and triumphs, but there’s a sweetness to the movie’s final shots and a lingering sense of kindness that ends the proceedings on—and marks Chazelle’s further promise as a filmmaker with—an undeniably high note.